Jul. 26, 2013 5:00 p.m.
Festival’s Organizers Vicky Pyle and Lisa Schoening are all smiles at the festival’s instant success. Millet – On Friday night the sound of music drifted on down over the town of Millet. Emanating from the park at the end of Hillside Road and the Millet trail system were the positive vibes of a community gathered together. 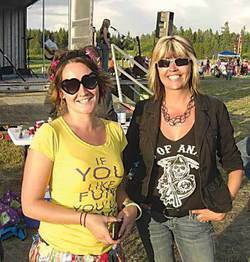 Using music as their vehicle, organizers Lisa Schoening and Vicki Pyle staged this event to raise awareness for cancer research. Their friend and local music enthusiast Mike Gauthier passed away in May after a three year battle with thyroid cancer. This inaugural Firefly Festival was dedicated to him, and any profits realized were to be donated to thyroid cancer research. Judging by the large crowd of smiling and relaxed faces this was a success. The event featured some very good acoustic guitar players on either the Norex main stage or the side stages on the edge of Millet’s trail system. If you were thirsty and needed a cool one you could have tried the beer garden to satisfy yourself. This was a multimedia experience with face painting and tattoos for the kids, along with the Best Glow Costume and Lantern Contests. The New Behli Sisterhood Belly Dance troupe also performed and at one point used fire as part of their performance. Of course all of this was done under the watchful eye of the Millet Fire Department. If you were hungry after all this, there were food vendors at your service. The Firefly Acoustic Music Festival was a free event that was “put together for the community and financed by local donors”. Thane’s Music Shop donated a guitar that was raffled off and some of the vendors in turn donated part of their profits for cancer research. There were donation cans all over the site if anybody wanted to donate to this worthy cause. The musicians volunteered to play for free and were a very talented group. The most amazing thing about all this is the fact that the festival was put together in only 1 ½ months. An avid music festival fan would think that Vicki and Lisa and their band of volunteers had done this a few times before. Both ladies were “very happy and surprised by the awesome turnout and support”. Lisa described Mike Gauthier as a “true friend and music lover and by all accounts a caring and helpful person”. Mike is probably pretty proud of Vicki and Lisa, and the people of Millet and surrounding area for their support and community spirit. “Our hope is that we can keep this event going for years to come”. It is obvious that there are a lot of music fans in in this area that would love to have an event like this every summer. Good job we will see you again next summer.